Handcrafted dinner fork. Sterling silver. Reeded borders and stylized rope accents. Dishwasher safe; hand washing recommended. 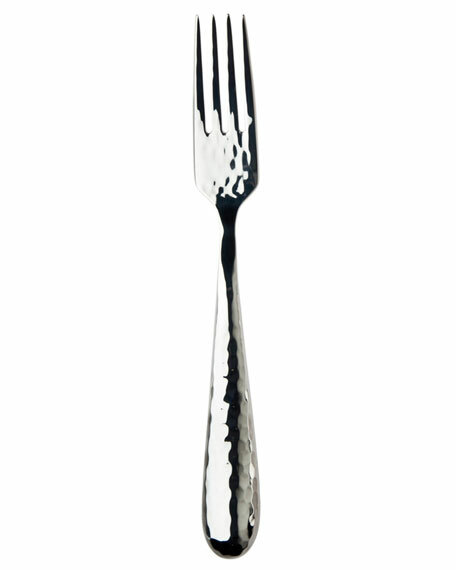 19/10 stainless steel dinner fork. Approx. 8.5"L. Dishwasher safe; do not use cleansers that contain citrus or abrasives. Imported. Sterling silver reproduction of an early 18th century Regency design. Design on the dinner fork handle requires careful chasing and finishing by hand using traditional techniques. Hand wash. Made in France. Salad fork with hammered design on both sides of the handle. 18/10 stainless steel. Dishwasher safe. Imported.